It's degustation time! I have wanted to have a degustation meal for years however no one seems to share my enthusiasm for such an affair... until last night! 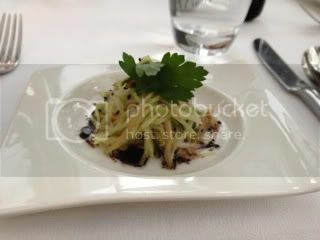 We opted for the 7 course degustation which was a good call - good luck eating everything on the 9 course menu! Overall i thought it was fabulous - the venue was great, the wait staff pleasant and helpful although we would have had at least 5 different staff during the evening and the food was delicious. Admittedly, i wasn't completely blown away by the food however my expectations were probably a tad unrealistic. The waiter coming around with a tray of sunglasses during sunset was a bit humorous - from the look of the full tray i don't think there were many takers! 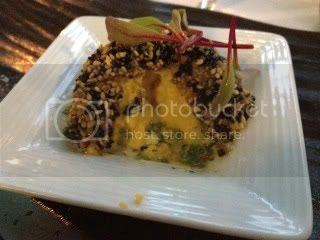 For modern asian cuisine in Melbourne i still prefer Gingerboy and for high class Japanese i'd head for KoKo @ Crown. Just a bit of a disclaimer - although i tried my hardest to hear the waiter's description of the course, i may have gotten some of the elements confused with the omni version as the waiter had to explain both to the table. Course 1: Apple and mushroom salad with ponzu dressing. A deliciously fresh and tangy salad with a moorish tangy dressing. I wish i hadn't scoffed the bread earlier so i had something to mop up the last skerrick of dressing. 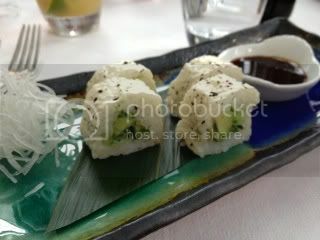 Course 2: Avocado and cucumber roll. Not wrapped in nori - no idea what the white wrapper was although it didn't have a strong taste. This course was so-so - not all that different from something you'd get at your local takeaway sushi store. Course 3: Gingered carrot soup with coriander shoots. 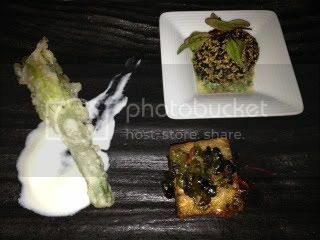 Zucchini flowers, tofu, eggplant, asparagus, enoki and king oyster mushrooms. This course was fabulous! Deliciously thin and crispy tempura batter, not in the slightest bit oily with a delicious sweet chilli tomato dipping sauce. Check out the oozy filling! Chinese turnip cake with black bean and seaweed pickle (bottom right), pumpkin and tofu with a sesame crust on a coriander puree (top right) and stuffed zucchini flower with buffalo mozzarella (left). The final savoury course. 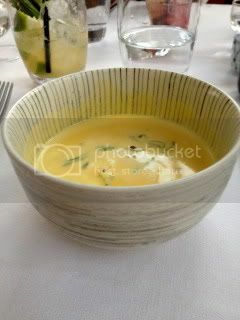 I thoroughly enjoyed it as it was different to anything i'd ever tasted (except the zucchini flower.) The turnip cake was made from finely grated vegies, cut into a cube and fried. The pickle was a fantastic salty condiment. The tofu pumpkin was deceiving. On the outside it looked like a firm cube of sesame crusted fried tofu, but cut into it and it was soft and oozing. 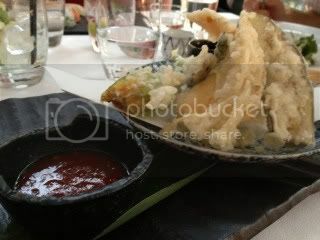 A very subtle flavour which complemented the strong sesame coating and coriander salsa. The zucchini flower was delicious but i thought it a tad repetitive as the previous course featured a zucchini flower - perhaps another protein-based dish would have been more appropriate. 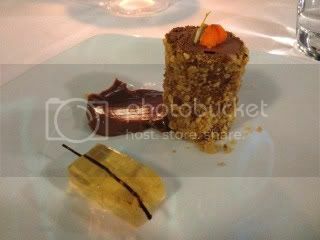 Course 6: Frangelico jelly, crusted hazelnut parfait, milk chocolate ganache. What can i say - it's a chocolate based dessert... how can it not be delicious? 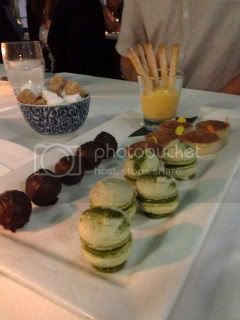 Green tea macarons, Kahlua cups, mandarin truffles, lemon curd. Although i make macarons all the time i have never made, nor eaten, green tea macarons. I dislike green tea to say the least and unfortunately i didn't really like these macarons. The Kahlua cups were deceptively runny but they were delicious and given Kahlua is my favourite liqueur, they weren't going to disappoint! The mandarin truffles were smooth and creamy as was the curd. I love lemon curd and this tasted just like my grandma used to make. Give me biscuit sticks and lemon curd any day! Overall it was a fabulous experience. The degustation way of dining is definitely my style. Bring on the next one!